Walls are the perfect canvas for your creativity and design style. There are so many things you can do to a simple wall that will transform the space into a memorable, eye-catching place to relax. Use these wall design ideas to get your creativity flowing. Traditional wall murals required the help of a professional artist. Nowadays, you can cover your entire wall with a mural, all by yourself. 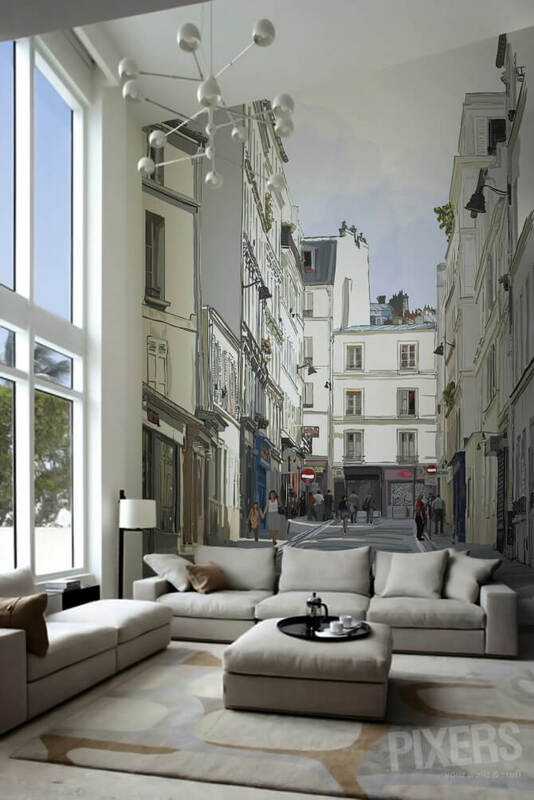 Wall murals can take you to the streets of Paris, down a forest path, or even into a gold and white jungle. The choice is entirely up to you. Stencils offer another way to go. Patterns repeat in every direction, offering movement and symmetry for the eye to enjoy. The final product can be subtle or over the top dramatic, depending on the look you desire. Patience and brushwork determine the quality of your design. Want something completely different? How about putting artificial boxwood hedging on the wall or hanging real flowers? Both are easily done and will give you a truly unique and eye-catching design. Oversized wall art can also give your home a brand new look, whether it is made from wooden slats, hand-printed textiles, or abstract paintings. Which of these wall art designs inspire you? If you examine a piece of granite, you will see it is made up of interlocking larger pieces of rock bonded together with a finer aggregate. These larger pieces can be in a number of colors, even in the same rock. 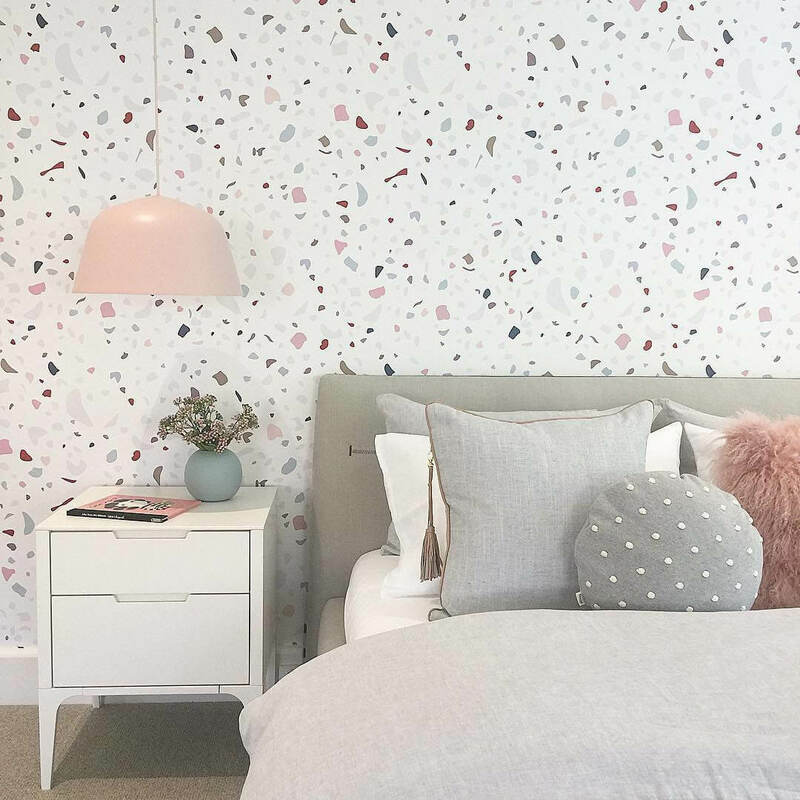 This wall design perfectly captures this colorful mix of shapes and patterns. 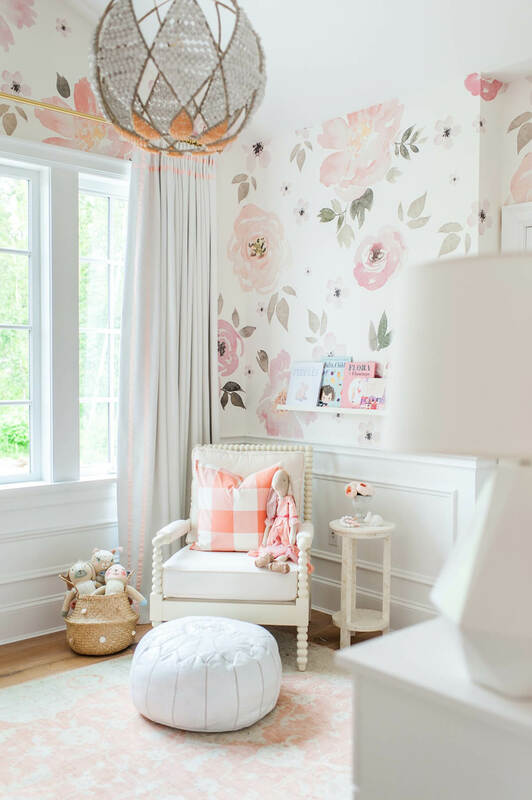 It offers a modern, naturalistic take on traditional wallpaper. A shower of green tropical leaves offers the perfect backdrop to this nature-inspired nursery. The different shades of green give an almost-3D effect of leaves falling from the trees high above to the ground below. 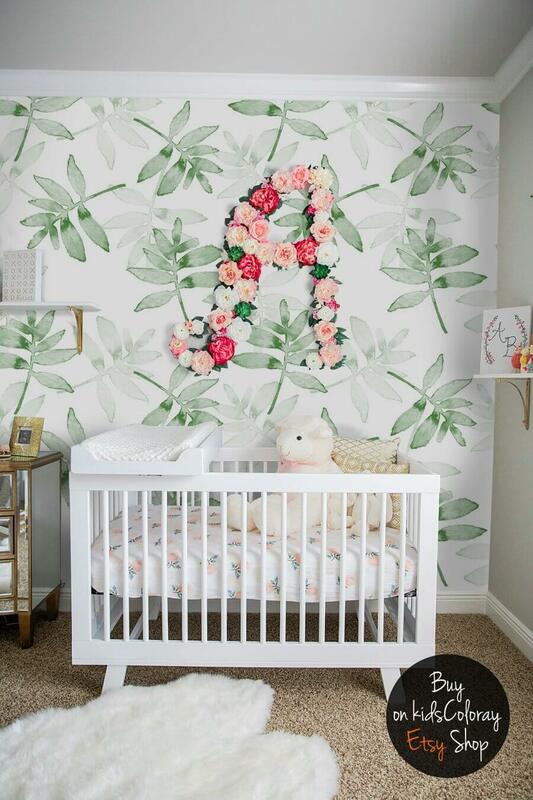 The baby’s initial in pink stands out from this backdrop with a multitude of roses flowing together. Finding the right design for a tall loft wall can be challenging. This street scene from Montmartre in Paris is a perfect solution. The over-sized window to the left seems to be part of the street scene filled with busy people, tall buildings, and quaint shops. The neutral colors make this wall mural perfect for many spaces. 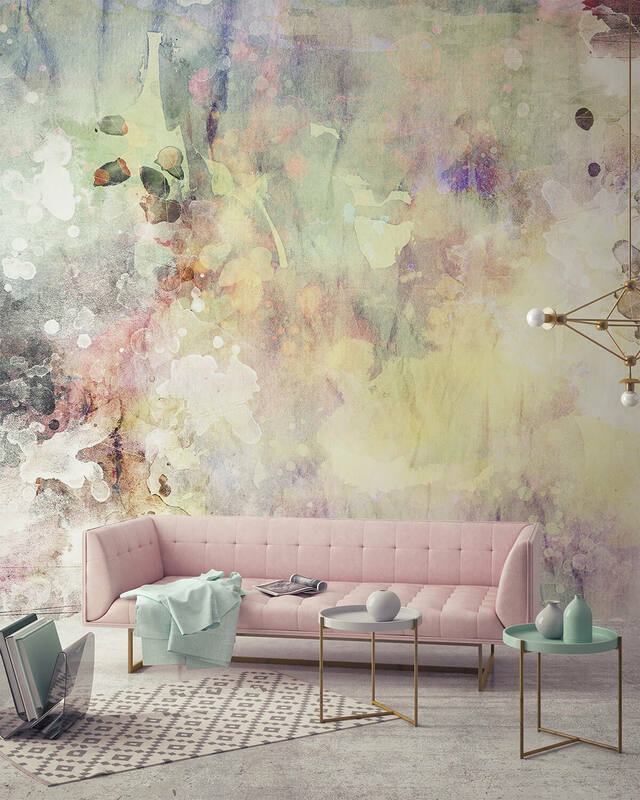 The delicate colors and soft brushstrokes of a watercolor painting make an eye-catching wall mural. Pinks, yellows, purples, and greens blend together in an almost abstract floral collage. It is bold enough to stand on its own but quiet enough to work well in almost any decor. It’s a true inspiration among wall design ideas. 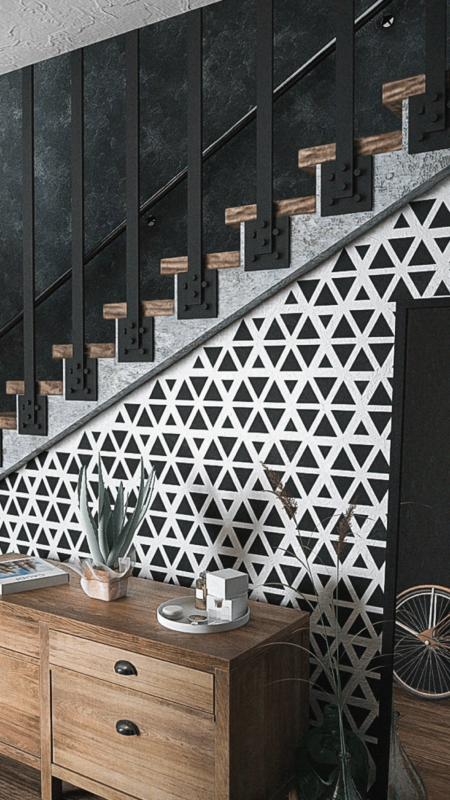 This arresting geometric pattern makes an instant impression on anyone visiting your home. The rich backdrop color provides a striking contrast with the pattern color. The repeated pattern brings movement and draws people in for a closer look. 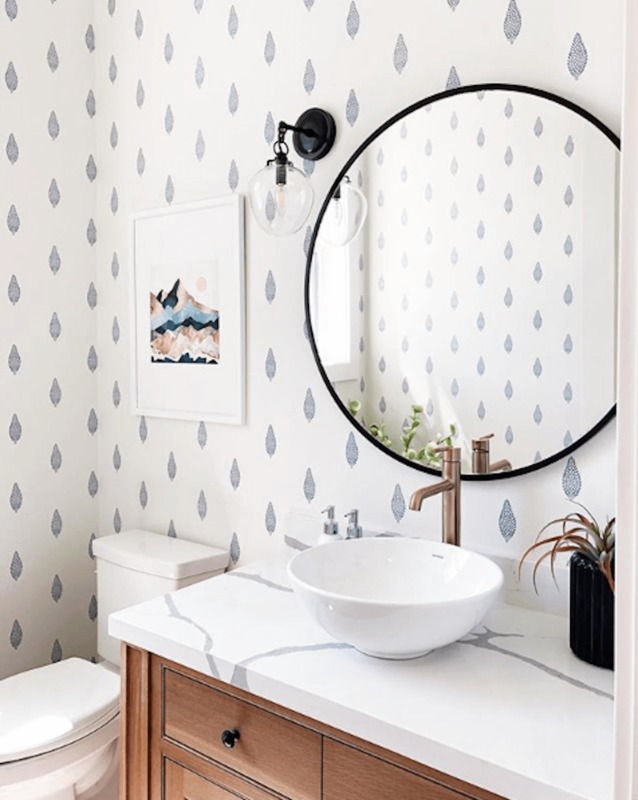 A reusable wall stencil was what made this pattern happen so precisely. 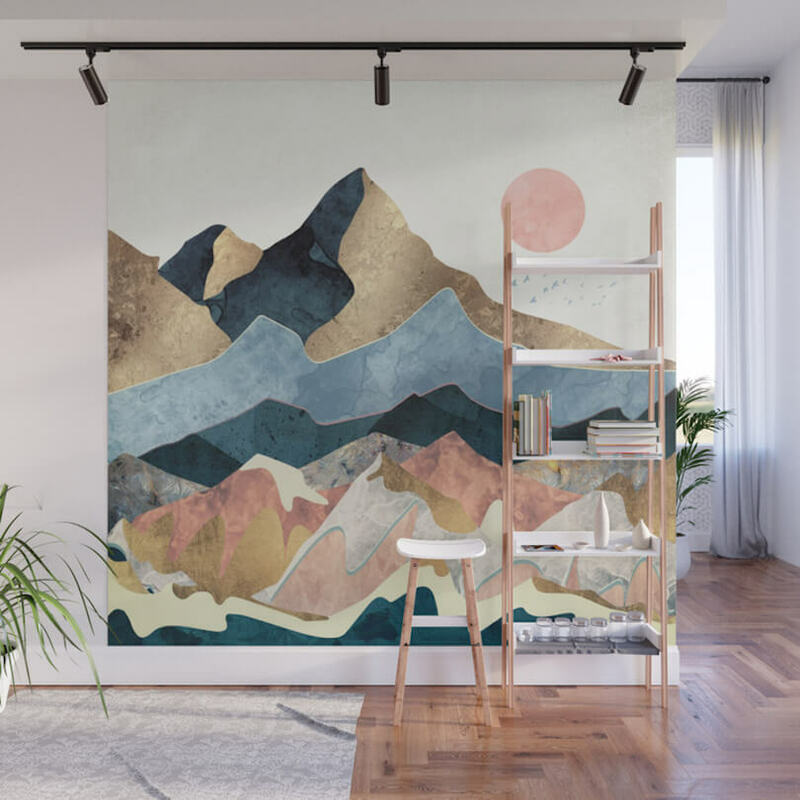 Dusty golden mountain peaks reach for the sky on this striking wall mural. Blues, pinks, and beiges flow down into smaller peaks below. A pink sun sits shining above. This desert mountain scene’s soft colors create an impressive scene on any wall you choose to display it. It’s perfect for an entryway or dining room wall. A large wall mural doesn’t have to be contained to a single wall. It can wrap around corners, doors, and windows if you want them to. 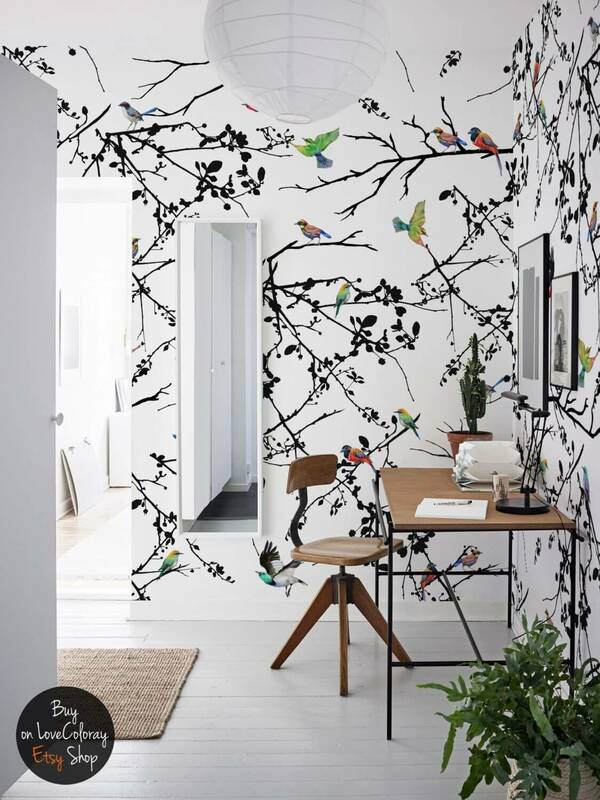 This intricate mural of birds and branches creates a modern forest filled with life and movement. The white background allows the colorful birds and dark branches to stand out without issue. One of the most eye-catching features of old patchwork quilts is the numerous fabrics used to make them. 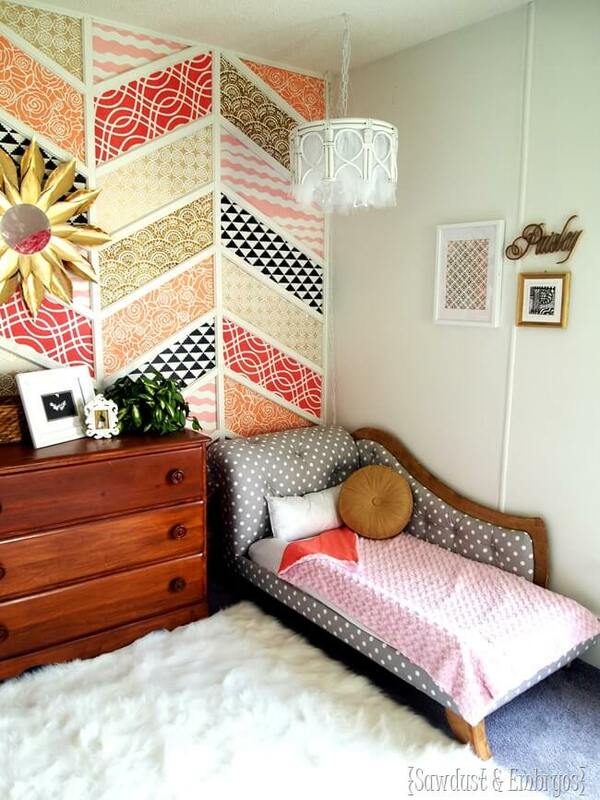 This standout amongst wall design ideas recreates the old-time quilt look in a herringbone arrangement. Pinks, greens, reds, and blacks pop off the stenciled wall. Each section is framed by painted wood slats for a 3D effect. Do you want a wallpaper that doesn’t read like it was picked out by your grandmother? This navy blue pattern gives you just that. A simple blue tree repeats in a trellis pattern across the entire wall. The smaller size of the trees allows the white background to dominate the palette. The overall effect is both traditional and modern, perfect for any decor. 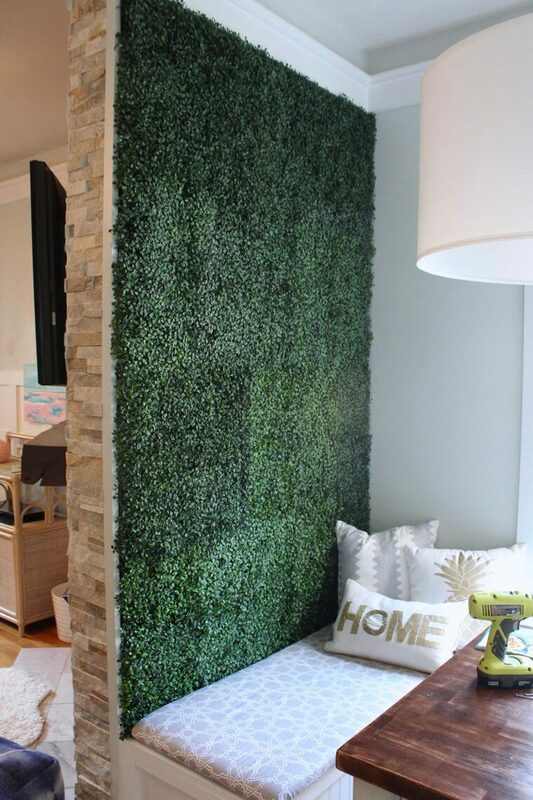 Bringing the outdoors in is easy with this boxwood hedge accent wall. Of course, it’s not real boxwood. However, from almost any distance, you wouldn’t know the difference. The deep green color and leafy texture is an unexpected contrast to the brick and drywall on either side. Looking for a unique focal point? Add some artificial boxwood in a surprising place. Are you looking for a backdrop for a special event? How about fresh flowers flowing down the wall? 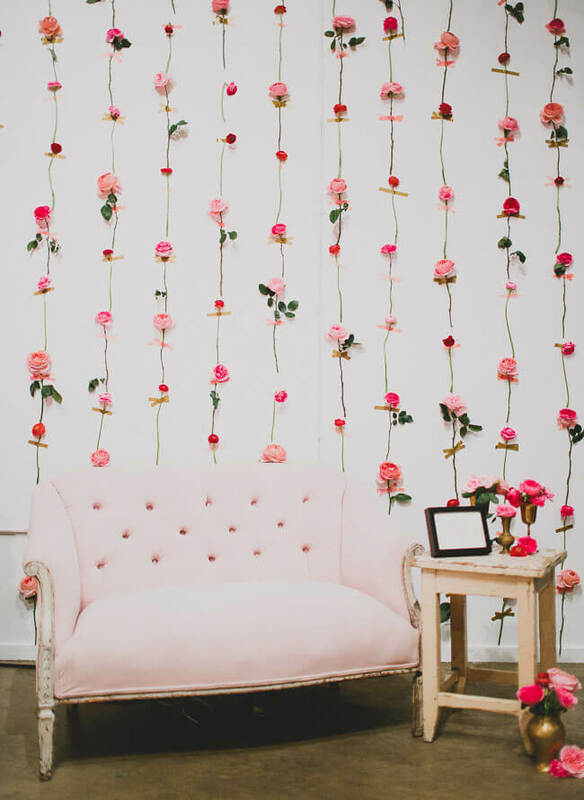 This vertical backdrop is a cascade of fresh flowers taped directly to the wall. Where one stem ends, a new bloom begins. The pink flowers and green stems offer a trellis or waterfall effect. It’s a perfect backdrop for photos or for behind the guest of honor table. Large pink and purple flowers and gentle green leaves flow across this muted nursery from its gable roof down to the floors below. Its white background blends completely with the white furniture and trim. The large scale creates a modern look while it retains its traditional floral feel, making it a great addition to any nursery or guest room. 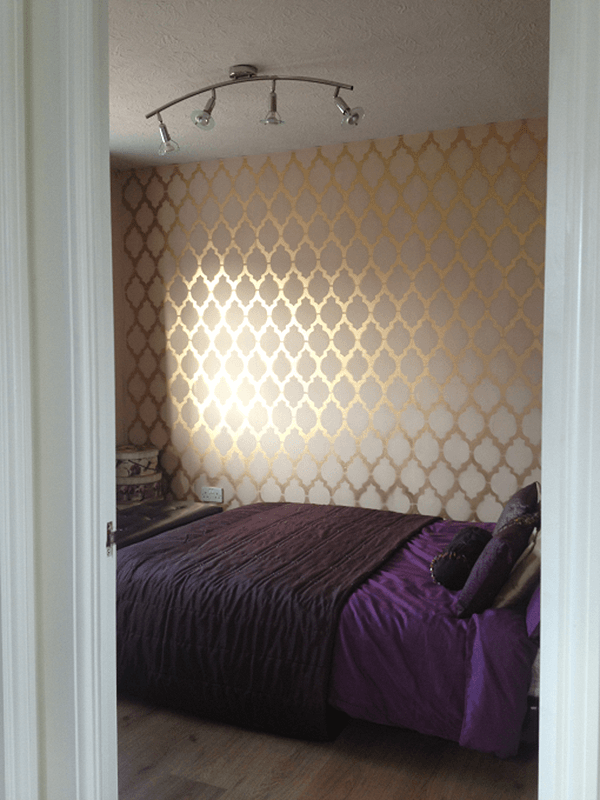 Gold offers a rich luster to this stenciled trellis that stretches from ceiling to floor and wall to wall. The gold paint stands proudly off the neutral color behind it, while the light from the window bounces off the reflective surface to give the room a beautiful glow and shimmer. This effect could work in almost any room of our home where you want a bit of tasteful drama. Leaves overlaying other leaves gives the effect that you are in the midst of a jungle. This collection of understated leaves offers a riot of pattern and texture, without overwhelmed by color. 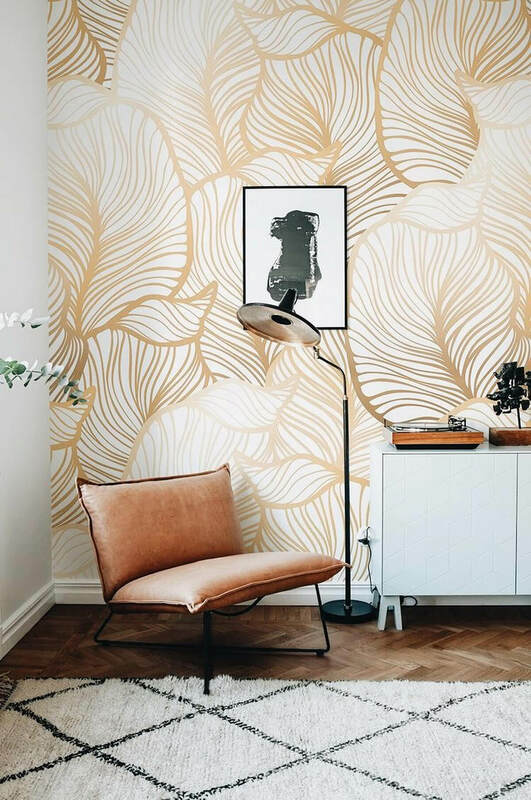 Its gold color of the lines brings that bit of coloring needed to make this wall stand out from other wall design ideas.